LVMPD is changing their inmate transport procedure after an inmate took off in a stolen car this week. An officer fired three gunshots at an inmate escaping near Maryland Parkway and Vegas Valley Drive. 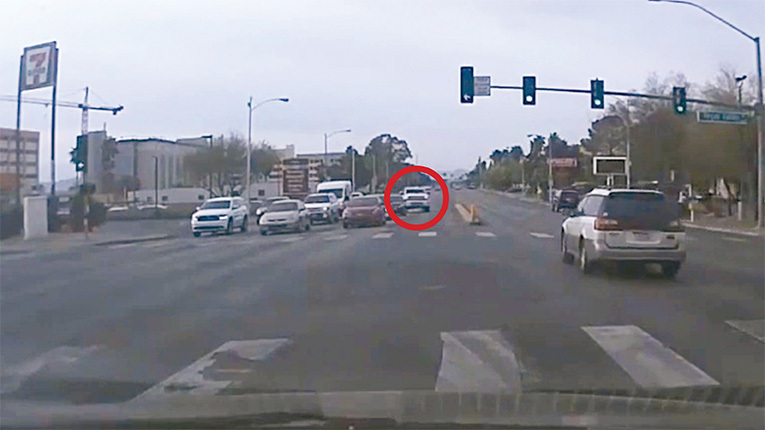 The shooting can be seen from dashcam video captured by a motorist. The footage shows a stolen pickup truck ramming into stopped cars at a red light. The prisoner on the run managed to maneuver his truck through traffic. Police say 52-year-old Clark County inmate Gregory Ganci was finishing up a routine medical procedure after he decided to make a run for a running pickup truck. “At this time Ganci, who was in belly chains and leg shackles, saw the unoccupied truck, jumped into the driver’s seat, and took off through the parking lot,” Assistant Sheriff Charles Hank said. Police continue looking into how the shackled four-time convicted felon managed to escape before being recaptured and taking a bullet to the arm. Changes are already being made. “Moving forward we are requiring two officers to be with any inmate we are taking outside a facility,” Hank said. We now know the officer who fired on Ganci was not wearing a body camera. “He was not in plain clothes. He was in uniform. He should have had his body camera with him,” Hank said. Police are looking into just why the officer did not have his camera on. Investigators say the owner of the stolen pickup truck told police there was a gun inside the vehicle.